[Loc] Dany's Surgery - page 9 - meet the mods & staff - Furtopia | Family Friendly Furry Forum and IRC Chat! According to her chip, today is Kimba's birthday. She's 7. We've had her for three months. In theory, we are due for a home checkup from the shelter any day now. She's settling in well. Training is ongoing - she will get into cars happily, she loves to get in them. But will cry and whine when she's secured in or we start to move. She is still anxious to go new places that are outside, and taking her for walks involves going the route she knows and loves, and then adding a small amount on to the end to gently push her limits. She doesn't like being left alone, but will deal with it for an hour or two. She and I have fallen into a morning and early afternoon routine, which suits both of us fine for the time being. Excuse her wonky smooshed headfluff in that picture, she had been lying across my laptop. In November, she developed a lump on her side. It was gently cut open and cleaned out under a local anaesthetic, and the vet announced it was a cyst full of necrotic tissue. Due to Dany having bad lungs, it couldn't be removed - general anaesthetic ran too high risks of her going into respiratory arrest. The cyst wall had to be left in place. Sadly, this meant that the chances of it coming back were higher. Sure enough, it came back. She had to have it removed this time or she had an increased infection risk (and she has a compromised immune system). 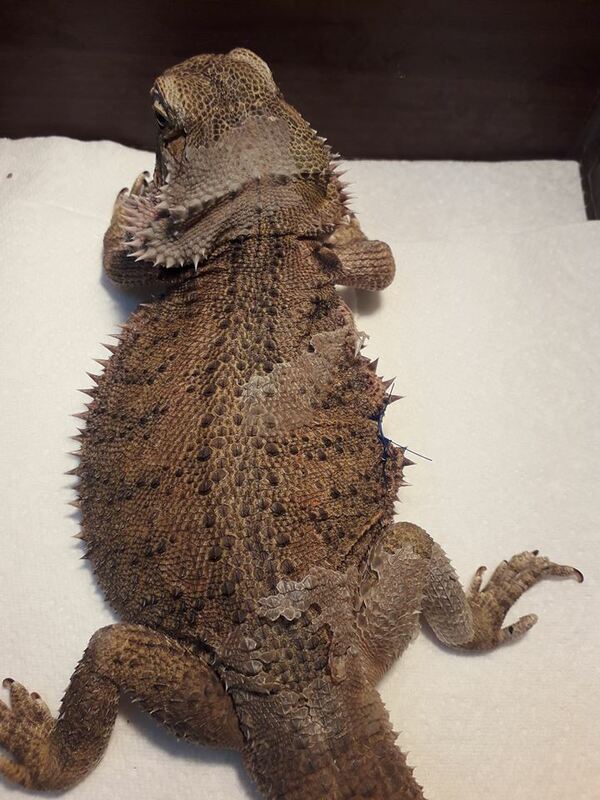 Removal under local was impossible - the cut needed to remove it would have gone down too far (I was told the vet would have literally been seeing her ribcage, as the muscle layer is not very thick) and stitching up an awake and active reptile wouldn't happen. The vet assured me he would use an anesthetic that has as little effect on breathing as possible, and Dany would be on a ventilator the whole time. If she started to have trouble, she'd be woken up right away and he would stop and close her up. The operation went with no issues. It took longer to get her asleep than it took to cut the lump out (she is apparently resistant to anaesthetic) and she was breathing unaided the whole time. She had three stitches (visible on the right) and is missing a handful of spikes (which will not grow back). The lump came out nice and easily, no bleeding or leaking, and she was eating and drinking this morning. She is probably quite sore, so I am handling her as little as possible and very carefully when I do. She goes back for a post-op check on Monday, and the stitches will be in until March - estimated removal is 3-4 weeks (as reptiles have different healing rates to mammals). But it's all looking optimistic. I've also decided that I will ask for the optional biopsy to be done on the lump - Chances are it is just a cyst, but it will be good to know for sure, and to know if it is likely to reoccur elsewhere down the line. For now, I'm just happy to have the little trooper home and recovering nicely. Happy Birthday to you Loc. I hope your havilng a fine day. Hope Dany is still doing well. And, I love the most recent pic of Kimba. 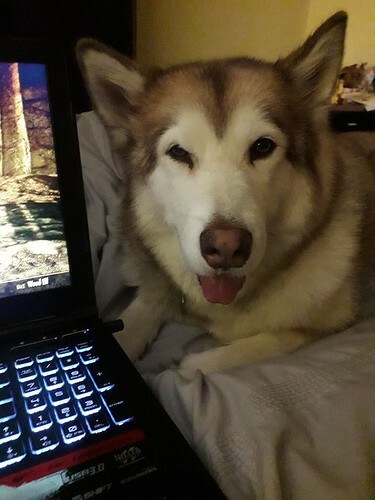 I had a husky like her, but she was grey in color. So I spent a chunk of my birthday at the vet with Dany, having x-rays of her feet and lower legs. Which are a bit of a mess. She's had multiple fractures in her toes which have healed very crooked. Her bones just flat out developed wrong in places. I actually hate her previous owners. She has arthritis and it looks like her previous MBD is getting weird with age. She may be in the process of self-amputating a very damaged toe (if so then it has been slowly happening over YEARS with no bad effects), but it may just be getting super gnarly with arthritis. If it does come off, it won't bother her and I can keep it clean. The vet is pretty confident that she is in no pain at all for the time being, and if she does develop pain then we can treat her for it. Yikes. That stinks. Sure hope she improves. She is in good hands now with you. Her arthritis will probably get worse with age, sadly - it's just the way it goes. She's 8 now and an average age of beardies in captivity is 10-12, so she's starting to get on (and doing very well, considering her host of medical issues). Still, it isn't bothering her in the slightest and her MBD is under control and has been for years.